Data is getting bigger and more complex by the day, and so are the choices in handling that data. As a modern application developer you need to understand the emerging field of data management, both RDBMS and NoSQL. 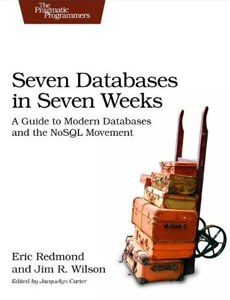 Seven Databases in Seven Weeks takes you on a tour of some of the hottest open source databases today. In the tradition of Bruce A. Tate’s Seven Languages in Seven Weeks, this book goes beyond your basic tutorial to explore the essential concepts at the core each technology. Redis, Neo4J, CouchDB, MongoDB, HBase, Riak and Postgres. With each database, you’ll tackle a real-world data problem that highlights the concepts and features that make it shine. You’ll explore the five data models employed by these databases-relational, key/value, columnar, document and graph-and which kinds of problems are best suited to each.